There are many desserts to choose from at The Crystal Palace in Magic Kingdom. 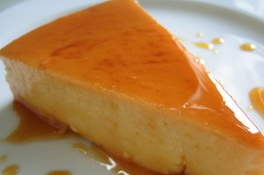 Flan is a traditional dessert found in Spanish-based cultures. A sweet, creamy custard that is typically caramel, but at The Crystal Palace it's coconut. Yum! In a small pan, over medium heat, melt 1 cup sugar and lemon juice. Stir constantly, and cook until a dark amber color. Remove from heat and pour caramel into an 8 inch round pan. Cool slightly until sugar begins to harden. In a medium sized bowl, mix all ingredients and slowly pour into cake pan. Bake in water bath at 325 °F for about 50 minutes. Serve.